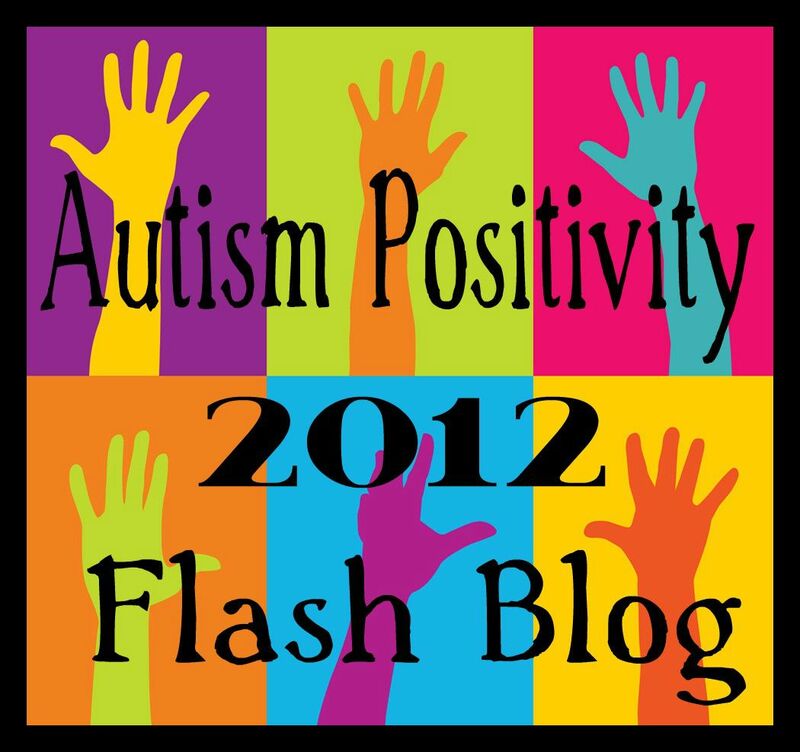 I am not Autistic… though, H’s dad, the Amazing Craig, is. We are learning so much about ourselves from our experiences with H.
We are affected deep to our core – and we have learned amazing skills to use with our child, within ourselves as individuals, within our relationship, and in our broader movements in the world. Being non Autistic doesn’t mean that I am not sometimes uncomfortable or awkward in social situations, but I usually understand the intent and motivation of others and I am able to understand differing perspectives with ease. I communicate well and I am well versed in reading non-verbal social cues, along with the underlying meaning of tone, nuance, and possible double entendre, and I am chronically addicted to irony. 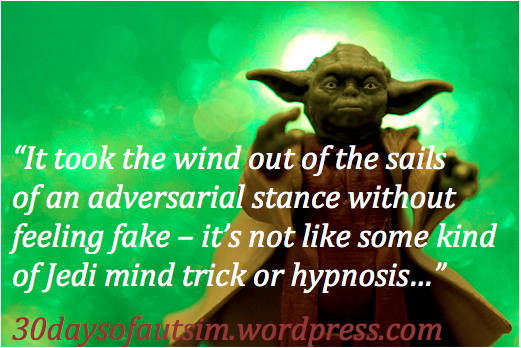 It has been noted that I have some autistic shadow traits, tics, and attentional/focus challenges. I am happy to be alone and find too many people overwhelming. I can only handle the mall in 30 minute doses. I am good at social chit-chat for a short time – but I find it boring if it is lacking in substance, and I require recovery time from social gatherings. I have sensory issues, and OMG I have a difficult time remembering the names of people I see regularly. In my relationship with Craig, I have noticed that there can be a huge struggle with letting go of being positional. This can be the case in any relationship, of course, but I think it may be more of a challenge in an Autistic/non Autistic relationship. Being able to understand and reflect back each others’ point of view without feeling like the explanation will prove that one partner is in the right/the other in the wrong seems to be an important component. It is difficult to be in a place to understand the other view-point if you feel you have to protect yourself against an assault of sorts…. or just against having it pointed out that you were the one in the wrong (again). There may be a tendency for Autistic adults to feel persecuted at times. As children and young adults the world may have come at them unevenly and it is also likely that their responses at times appeared uneven. It is understandable that if someone has grown up with social errors blowing up in their face, seemingly out of the blue, then they might be sensitive to criticism. Sometimes they may even perceive criticism when none is given or intended. Perhaps thinking about an Autistic partner in this way might help us to support them in hearing our perspective – Sharing each others’ perspective can be a win/win scenario that brings partners closer together. It is interesting to watch the bluster of positionality fade out of someone’s fighting stance when they truly feel heard and understood by their partner. When this happens, they may find themselves in a place where it is much easier to listen to another perspective. And really – then it can be about understanding another’s perspective – rather than about who was right and who was wrong. I checked with Craig before publishing this because I wanted to honour and respect him and his privacy. 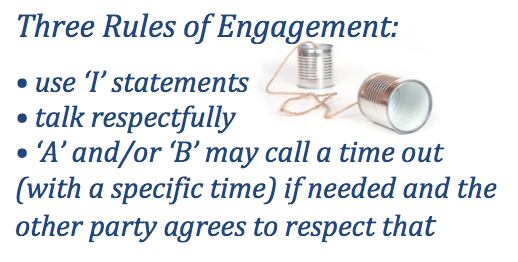 His response was that it was essential to post this article “because it will be providing a service to others.” He explained that although the reflective listening model has been something that we have had to overtly learn, practice, and rehearse – it has ultimately developed into a powerful relationship strategy. “In fact,” he reminded me, “we had to use the model just last week.” and interestingly neither of us could remember what our disagreement was about: we just felt that the other listened and things had been resolved. 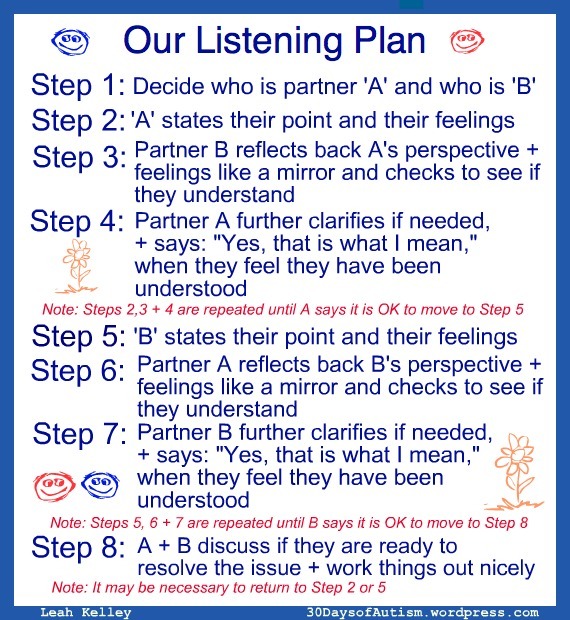 Below is a model of the reflective listening strategy that Craig and I use. It is not exactly rocket science – but it has really helped us learn to listen and understand each others’ perspectives. And hey… it’s visual! Gotta love that!! This entry was posted in Autism, Autistic, Communicate, listening, Neurodiversity, Neurotypical, visual strategies and supports and tagged Autism, conflict resolution, Neurodivergent Relationships, Neurotypical, Perspectives, reflective listening, reflective listening strategy, relationship, strategies. Bookmark the permalink. Thanks for writing this. It seems so easy and common sense, but when one is in the moment it isn’t always so. I know my husband and I get caught up in the whole game of who is right and who is wrong scenario too often.I do often feel persecuted and my husband often feels like I bombard him with criticism as if nothing he does is right. I’m working on trying to let go of pre-scripted ideas in my head of what I feel needs to happen (and subsequent upset if other don’t follow MY so logical plan!) and let things be. Hard work for me, but if I’m ever to get along with a seriously disorganized ADHD husband I have to overlook the mess and inattention to details and look for the positive. He has lots of good traits, but I find with so many couples they are so busy looking at what is wrong they forget to see the right. I appreciate that you find this helpful. We have had a raggedy old typed copy of this taped to the inside our kitchen cupboard for years. I was actually astounded (and delighted) to find that it was still hanging there when I wanted to reformat it for this post. (It almost felt like I was able to break the time-space continuum – lol!) At times I come to a point of familiarity with certain things that I do not even notice them anymore. Nevertheless – my digression here does illustrate a point: it took as a while to practice and learn this strategy and it felt awkward at first. However – as awkward as it may have been – it WORKED!! Now – we have completely internalized the process… so we no longer refer to the sheet. Now even the act of undertaking the process brings a calm to our interaction, because we both trust that we will be heard and that the strategy will work. I agree with your statement about looking for the positives within a relationship and the importance of focusing on the good qualities of a person. This too is a powerful strategy. It is one that we seem to understand when we are thinking about our children – I think it is appropriate to extend this same stance to our partners. As always, I appreciate your comments and insights!! Please keep ’em coming!! I will keep commenting if you keep writing! 😀 I also think that I will copy this and post it somewhere for us to see. This honestly means a ton to me – I’m so glad you posted that, especially since I just wrote this since I’ve been in a funk with my relationships with NTs lately and I’ve been feeling like everything is criticism. I’m so glad you and your husband have a great relationship and that you wrote this and put it up here, because it gives me hope for finding my own happiness out there. Thank you so much for your comment Steph and also for leaving the link to your post. I read your post and can sympathize with the sometimes negative power of self-talk. I have found for myself that there are some amazing cognitive behaviour strategies that have really helped me to shift my thinking around many aspects of the way I experience the world. The shift in thinking can have such a positive effect upon the emotional experience as thoughts and feelings are so interconnected. It is fascinating really! I hadn’t read this post before. It’s interesting to hear this perspective as I was the aspie male in an aspie/NT marriage that lasted 8 years. She and I are still good friends. Your listening plan is exactly the same as an activity we did in one of my college philosophy debate classes. There are so many books, articles and blog posts on female NTs in relationship with AS men. I want to read something from the perspective of a female Aspie in a relationship with an NT man. Me too! I’m a female Aspie married to an NT and there is nothing. I like the advice in this post & think it could apply to any relationship. Because I’m Aspie & am not wired great for communication, I got the book, “How to talk to your kids so they’ll listen & how to listen so your kids will talk.” (or something like that). It discusses a lot of this mirroring you recommend & honestly, I use its teachings in every conversation I have. I’ve read it a million times. It’s such a relief not to hear myself spewing advice or babbling about myself all the time. This book (and the advice above) is the only reason I figured out how to stop doing that. I am an Aspie married to an NT and Leah’s post could easily have been a personal letter to me from a close friend! Leah is a very rare and special part of the Autism community, who is able to connect intimately with both Autistic people and our Neurotypical brothers and sisters. Leah is a Connector and a valuable Autism Advocate. On a personal note, as a Special Education teacher and Mother to a wonderful Autistic child I think Leah is also an unsung Heroine. I am so moved by your post and your positive comments! Hi Leah – I’m coming to this post really late. It’s great and so positive compared to so many I’ve read. Are you still writing and if so, can I add a link to your blog from my website for NT partners? This post makes very interesting reading, and many of the points you make will be very useful for myself and my NT husband. Thank you for sharing your thoughts and experiences.